The claim that heritage practice in Asia is Eurocentric may be well-founded, but the view that local people in Asia need to be educated by heritage practitioners and governments to properly conserve their heritage distracts from the responsibility of educating oneself about the local-popular beliefs and practices which constitute the bedrock of most people’s engagement with the material past. 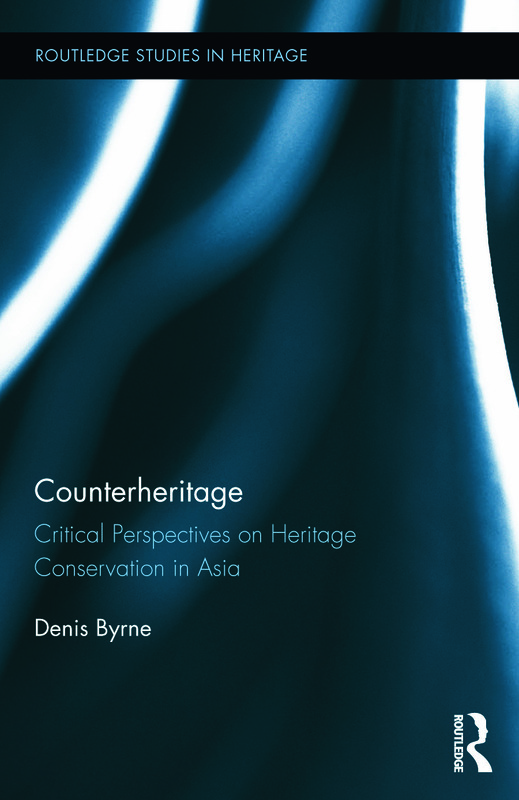 Written by an archaeologist who has long had one foot in the field of heritage practice and another in the academic camp of archaeology and heritage studies, Counterheritage is at once a forthright critique of current heritage practice in the Asian arena and a contribution to this project of self-education. Popular religion in Asia – including popular Buddhism and Islam, folk Catholicism, and Chinese deity cults – has a constituency that accounts for a majority of Asia’s population, making its exclusion from heritage processes an issue of social justice, but more pragmatically it explains why many heritage conservation programs fail to gain local traction. This book describes how the tenets of popular religion affect building and renovation practices and describes how modernist attempts to suppress popular religion in Asia in the early and mid-twentieth century impacted religious ‘heritage.’ Author Denis Byrne argues that the campaign by archaeologists and heritage professionals against the private collecting and ‘looting’ of antiquities in Asia largely ignores the regimes of value which heritage discourse has helped erect and into which collectors and local diggers play. Focussing on the Philippines, Thailand, and Taiwan but also referencing China and other parts of Southeast Asia, richly detailed portraits are provided of the way people live with ‘old things’ and are affected by them. Narratives of the author’s fieldwork are woven into arguments built upon an extensive and penetrating reading of the historical and anthropological literature. The critical stance embodied in the title ‘counterheritage’ is balanced by the optimism of the book’s vision of a different practice of heritage, advocating a view of heritage objects as vibrant, agentic things enfolded in social practice rather than as inert and passive surfaces subject to conservation.